Designed for individuals who are seeking recovery or are new to recovery as well as for families or loved ones of those with substance use disorders. Recovery Coaching provides the support and resources critical to lasting recovery. Recovery Coaching is available one-on-one or within group settings and is offered either in-person or over the phone. Our grief support is designed for family members and loved ones who know a person who has died from addiction-related causes. This grief support differs from general grief support because the focus is specific to the traumatic loss and the stigma that often surrounds an addiction related death. Recovering u offers presentations and workshops on a wide range of recovery topics that can be delivered in a variety of settings. Purchase at Amazon.com $14.95 U.S.
Purchase at Barnes &Noble.com $14.95 U.S.
To access a sample chapter, click here. Read the latest book review here. Gloria offers two on-going coaching support groups. Courageous Caregivers© is a group for those who have a loved one experiencing active addiction, or who are new to recovery. A Different Kind of Grief© is a group for those who have a loved one who has died from addiction. Although there is time for personal check-in, both of these groups differ from traditional family recovery support groups and general grief support groups because there is a specific focus or theme for each gathering as well as coaching feedback to the group and/or individual members. Both groups are offered in six-week segments and limited to six members to allow for bonding and trust to establish quickly. Even though the majority of Gloria's personal recovery has centered around relationships with others, she is also in recovery from food addiction. Gloria has been in recovery for over 30 years. Gloria Englund says, “Love brings hope, and hope fosters recovery.” It’s a simple formula—not easy, but simple. Gloria shares a series of lessons she learned through living with her son’s struggle to overcome his addiction. She points out the subtleties of language that play a role in stigmatizing addiction, and gives us a practical guide to help us see through the fog and stay in relationship with loved ones who have addiction disorders. 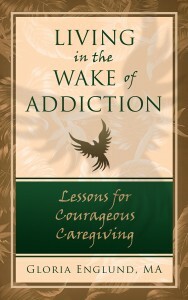 Living in the Wake of Addiction: Lessons for Courageous Caregiving is chock full of practical wisdom. With unadulterated courage, hard-earned wisdom, and a mother’s compassion, Englund seeds her powerful story of family, drug addiction, and trending research into our culture’s “deeper consciousness.” Validating the phrase “breakdown-breakthrough,” she births renewable hope, self-awareness, and ultimate resolution, trusting that each experience will reveal the next step of one’s journey. Englund’s Lessons and information on stigmas and medical breakthroughs are groundbreaking and transferrable when laid next to other hefty challenges in our culture. As a parent and as a community leader who has worked with at-risk kids for over twenty years, I am painfully aware of how vulnerable kids are to addiction. I am very impressed with Gloria Englund’s courage as a mother to share the painful journey of her son’s addiction and overdose. Gloria tells this moving story with a great deal of self-reflection and self-knowledge. I would recommend this book to anyone who wants to understand the struggles of addiction, and to find a way to deal with the challenges in a helpful and healing manner.